Keep your tealight trough ready to glow with this set of 12 tealight candles. Candle holders get all the attention for being pretty. But it's the little guys behind those eye-catching accent pieces that put in the hard work. Let's hear it for tealights, the wax wonders that really shine. This set comes with 12, so you can enjoy hours of soft, flickering candlelight. Place four at a time in one of our tealight troughs, or pop one in your favorite candle holder. (Just make sure to give 'em a little credit while you're basking in their subtle glow). Made in Malaysia. Add these tealights to the below: Nordic Tealight Trough and the Maple Leap Tealight Trough. Trim wick to 1/4 inch before lighting. 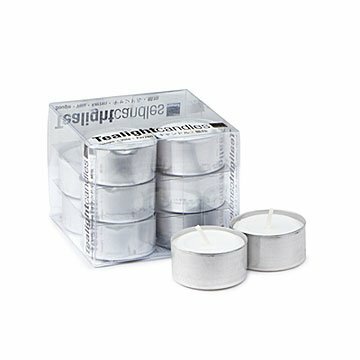 Keep candle free of any foreign materials including matches and wick trimmings. Only burn the candle on a level, fire resistant surface. Do not burn the candle for more than 4 hours at a time. Discontinue use when 1/2” of wax remains on bottom. Never leave a burning candle unattended. Keep wick trimmed to avoid big flame, don't burn longer than 4 hours at a time to avoid overheating. Keep away from drafts, pets and children. Burns up to 5 hours.